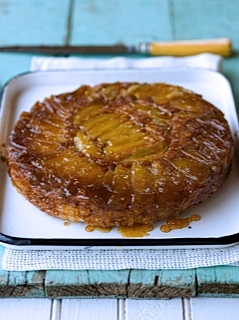 There are few flavours as addictive as caramelized apples, especially as one of the first tastes of the day. This spectacular dish is an A.M. showstopper that's so easy to make you'll impress yourself in your own kitchen before impressing everyone at your table! Preheat your oven to 350 °F (190 °C) using your convection fan if you have one. Pour a half-cup or so of water into your favourite skillet or non-stick fry pan over medium high heat. Sprinkle the sugar over the surface of the water taking care to avoid the edges of the pan then watch as the sugars flavour journey begins. Its inevitable temperature rise will dramatically transform it from bland white to golden brown. The trick is not to stir. The sugar will melt evenly without intervention. Water is the key. As the water simmers it rapidly absorbs the dissolving sugar forming a simple syrup. The water steams away, eventually disappearing as the steam subsides, leaving behind pure, evenly melted sugar. With the water gone the syrup’s temperature quickly rises into the flavour zone. As it begins to lightly colour gently swirl the works to help it evenly brown. Be patient. When the caramel is deeply golden brown and amazingly aromatic, about 10 minutes, carefully toss in the butter. Turn off the heat and whisk until smooth. Core the apples and slice each one into 8 wedges. Arrange the wedges cut side down on the caramel to form an attractive outer ring, overlapping as needed, then filling the inside. In a large bowl, whisk together the all-purpose flour, whole wheat flour, oats, baking powder, nutmeg, and salt, evenly distributing the finer powders amongst the coarser ones. In a second bowl, whisk together the eggs, milk, oil, brown sugar, and vanilla. Pour the wet mixture into the dry one. Stir with a wooden spoon just until a smooth batter forms. Carefully pour the batter over the apples. Bake until firm and cooked through, 35 to 40 minutes. Gently loosen the sides with a rubber spatula, then cover with a large serving plate. Very carefully (the caramel syrup is very hot!) invert the works, remove the pan, and reveal your masterpiece. Add a splash of water to the caramel left in the pan, reheat, whisking steadily over medium heat until a smooth sauce forms, drizzle it over the flipjack. Serve and share! Quick batters like this one are at their best when they’re barely mixed. Too much mixing encourages the gluten in the flour to toughen, as it does in bread dough. Instead, a quick, efficient mixing doesn’t overwork the flour, allowing the batter to stay tender as it bakes. This is one of Gabe’s favourite snacks. 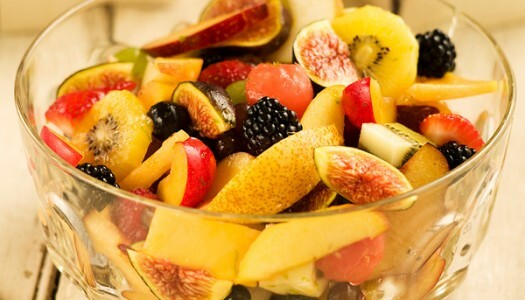 He loves fruit so we play around in the kitchen and see how many different kinds of citrus fruit, melons, tree fruit, grapes, berries and tropical fruit we can toss into one salad bowl. Our record is 32! 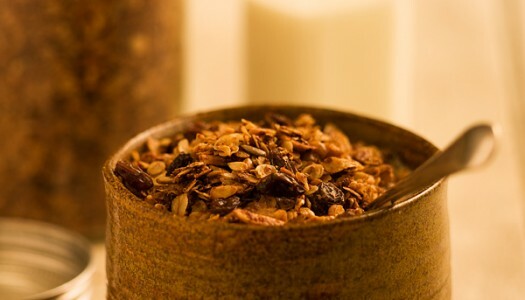 We serve this granola every morning as part of our legendary country inn breakfast. It’s a crunchy delicious start to the day!